03:15:00 Makes 4 servings, 1 cup (250 mL) each. Makes 4 servings, 1 cup (250 mL) each. What’s the trick to this Iced Cappuccino? Freeze fresh-brewed coffee in ice cube trays and then whip them up with cold milk for a frosty, coffee-flavoured beverage. Place coffee in filter in brew basket of coffee maker. Add water to coffee maker; brew. Cool. Pour into ice cube trays; freeze 3 hours or until solid. 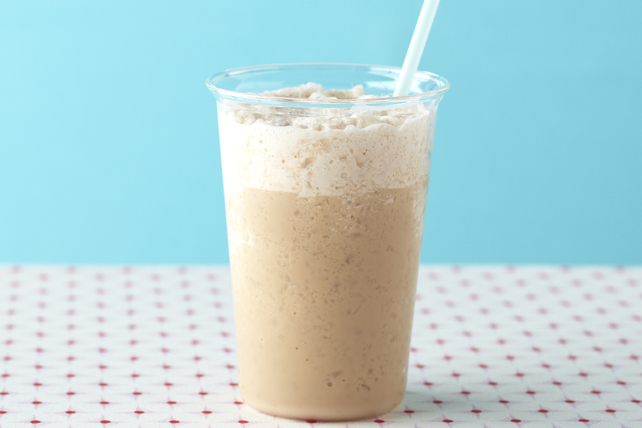 Blend milk and frozen coffee cubes in blender until smooth. Serve immediately. Pour leftover cooled brewed Nabob Coffee into ice cube trays. Freeze until solid. Use to chill coffee beverages without diluting the flavour. This great-tasting beverage can be part of a healthful eating plan. Serving Size Makes 4 servings, 1 cup (250 mL) each.